Common Chickweed (Stellaria media) is a dicot weed in the Caryophyllaceae family. In Denmark this weed first evolved resistance to Group B/2 herbicides in 1991 and infests Spring Barley, and Wheat. Group B/2 herbicides are known as ALS inhibitors (Inhibition of acetolactate synthase ALS (acetohydroxyacid synthase AHAS)). Research has shown that these particular biotypes are resistant to chlorsulfuron, florasulam, iodosulfuron-methyl-sodium, and tribenuron-methyl and they may be cross-resistant to other Group B/2 herbicides. For Stellaria media we now have 36 verified cases of resistance to SU herbicides. Six of these populations were also resistant to florasulam. Most of these cases are seed samples sent by farmers or consultants on suspicion of resistance. They have been tested in pot experiments including a susceptible and resistant reference population. In these tests tribenuron-methyl and florasulam have been applied in 4-6 doses. A survey on untreated plots in agricultural fields all over Denmark showed that S. media was resistant to SU herbicides in 15% of the fields. The only confirmed case of sulfonylurea resistance in Europe. The field is now set-aside land. Kudsk, P., S.K. Mathiassen and J.C. Cotterman. Sulfonylrea resistance in Stellaria media. Field, Greenhouse, and Laboratory trials comparing a known susceptible Common Chickweed biotype with this Common Chickweed biotype have been used to confirm resistance. For further information on the tests conducted please contact the local weed scientists that provided this information. There is no record of differences in fitness or competitiveness of these resistant biotypes when compared to that of normal susceptible biotypes. If you have any information pertaining to the fitness of Group B/2 resistant Common Chickweed from Denmark please update the database. The Herbicide Resistance Action Committee, The Weed Science Society of America, and weed scientists in Denmark have been instrumental in providing you this information. Particular thanks is given to Per Kudsk, and Solvejg Mathiassen for providing detailed information. Uusitalo, T. ; Saarinen, A. ; Mäkelä, P. S. A.. 2013. Effect of management of sulfonylurea resistant Stellaria media on barley yield. ISRN Agronomy 2013 : . Sulfonylureas represent one of the largest herbicide groups that have been widely used since 1980s. Their continuous use has resulted in development of sulfonylurea resistance in weeds. The aim of this research was to investigate options to manage putative sulfonylurea-resistant chickweed in barley stands and to evaluate the effect of chickweed and its management on barley yield. A field experiment was arranged as a randomized complete block design and included 14 herbicide treatments applied at two different times. 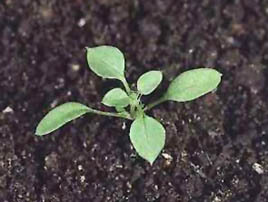 Tribenuron-methyl (sulfonylurea) affected minimal control of chickweed. A bromoxynil-ioxynil (photosystem II inhibitor) mix did not control chickweed efficiently. However, nearly total control was achieved with fluroxypyr, mecoprop, and their mixtures (synthetic auxins and photosystem II inhibitors). Chickweed had no effect on barley yield whether controlled or uncontrolled. Therefore, further evaluation of the chickweed management threshold would be needed. It seems that even in the boreal region, typified by a cold climate, limited solar radiation, a very short growing season, and relatively low-intensity cropping systems, unilateral use of sulfonylureas might lead to herbicide resistance. Although resistant weed populations can be controlled with herbicides of groups other than the sulfonylureas, this represents an increasing problem when planning weed management, especially when including sulfonylurea-resistant crops..
Moss, S. R. ; Marshall, R. ; Hull, R. ; Alarcon-Reverte, R.. 2011. Current status of herbicide-resistant weeds in the United Kingdom. Aspects of Applied Biology : 1 - 10. This paper updates information on the status of resistant weeds of arable crops in the UK, last compiled in 2005. It is estimated that resistant Alopecurus myosuroides (blackgrass) occurs on at least 80% of the 20,000 farms that spray regularly for control of this weed. Resistance to mesosulfuron+iodosulfuron, first used in the UK in autumn 2003, has been detected on >400 farms in 26 counties of England. Lolium multiflorum (Italian rye-grass) resistant to at least one herbicide mode of action has been found on >450 farms in 33 counties and resistant Avena spp. (wild-oats) on >250 farms in 28 counties of England. ALS-resistant Stellaria media (common chickweed) was found on >40 farms in 13 counties in England, Scotland and Northern Ireland. This represents the first documented case of a herbicide-resistant weed in Northern Ireland. ALS-resistant Papaver rhoeas (common poppy) was found on >25 farms in nine counties of England. ALS-resistance in Tripleurospermum inodorum (scentless mayweed) was documented for the first time in England, with resistant populations being found on three farms in Yorkshire. Partial resistance to the triazinone herbicides, metribuzin and metamitron, was also documented for the first time in England in Senecio vulgaris (groundsel), which also showed complete resistance to triazine herbicides..
Verschwele, A.. 2010. Perennial weeds in the cultivation of glyphosate-resistant maize. Julius-Kühn-Archiv : . An experiment was conducted during 2003 to 2009 on 3 locations in Germany to determine the influence of Roundup Ready (RR) on weed infestation in transgenic herbicide-resistant maize. Throughout the duration of the experiment, 94 species of weeds were found in soil seed bank, 15 of which were recorded only once. The most abundant species were Chenopodium album, Solanum nigrum, and Stellaria media. Among the weed species, Amaranthus retroflexus, Solanum nigrum, Veronica persica and C. album recorded higher numbers in all types of treatment. The lower application rates of Roundup Ready (1.5 and 2 × 2 × 2 litre/ha) resulted in inadequate weed control..
Marshall, R. ; Hull, R. ; Moss, S. R.. 2010. Target site resistance to ALS inhibiting herbicides in Papaver rhoeas and Stellaria media biotypes from the UK. Weed Research (Oxford) 50 : 621 - 630. Acetolactate synthase (ALS) inhibiting herbicides play an important role in controlling broad-leaved weeds. Biotypes of Stellaria media and Papaver rhoeas showing resistance to ALS inhibiting sulfonylurea herbicides (e.g. metsulfuron) were first identified in 2000 and 2001, respectively, in the UK. Recent work has shown that resistance in both species is due to mutation of the ALS gene conferring an altered herbicide binding site. Three P. rhoeas test biotypes from three areas possessed ALS gene point mutations (Pro-197-Leu or Pro-197-His) conferring ALS target site resistance. All were highly resistant to the sulfonylurea herbicides metsulfuron-methyl and tribenuron-methyl. Several alternative herbicides were tested against resistant P. rhoeas, with MCPA and ioxynil+bromoxynil being most effective. Four resistant biotypes of S. media were identified from widely separated locations. Two different mutations conferring ALS target site resistance were confirmed in two of these biotypes. A mutation conferring Pro-197-Gln substitution in a biotype from Perthshire was associated with resistance to metsulfuron, but not to florasulam. A mutation conferring Trp-574-Leu substitution in the biotype from Aberdeenshire conferred resistance to both herbicides. This is the first characterisation of ALS gene point mutations in resistant S. media. Currently, there are good alternatives for control of resistant biotypes, including fluroxypyr and mecoprop-P. The potential loss of alternative modes of action, as a consequence of reforms to the regulatory system for pesticides in the EU, represents one of the main threats to continued control of ALS resistant S. media..
Soroka, S.. 2007. Antiresistant strategy of herbicides application in Belarus. Progress in Plant Protection 47 : 371 - 381. In the total volume of pesticides applied in Belarus, herbicides make 70-75% and the decrease of volumes of application of the indicated pesticide group is not supposed. Knowing about the acquired resistance of many weed plants to symtriazine herbicides in Belarus after the accident in the Chernobyl nuclear power station this group of herbicides is not applied. In the nearest future, atrazine-based herbicides will be prohibited. In connection with the fact that starting with fifties of the past Century and up to now, the herbicides 2,4-D and MCPA group are applied to which Elytrigia repens [Elymus repens], Tripleurospermum inodora [Matricaria perforata], Polygonum spp., Galeopsis spp., Viola spp., Sonchus arvensis, Cirsium arvense, Artemisia spp., Taraxacum spp., Melandrium album [Silene latifolia subp. alba], Vicia cracca, Matricaria spp., Stellaria media, Myosotis arvensis, Spergula sativa, Poa annua, Apera spica-venti, Echinochloa crus-galli and other weeds are resistant. The Herbology Laboratory of the Institute developed and recommended an assortment of herbicides allowing to reach maximum efficiency against the indicated resistant weeds as well. In antiresistant protection technologies rotation, herbicide mixtures of different groups, method of action, surfactants, fertilizers and other substances raising the biological activity of pesticides against the resistant objects are recommended. Both pure and as a component of tank mixtures, the 4th generation herbicides, for example, sulfonylurea derivatives, are intensively used in Belarus. These preparations have low application rate, activity under temperature below 10°C, a wide spectrum of action and range of application periods (autumn and, spring), favourable toxicological, ecological and economic data, they are successively used in modern integrated systems of winter and spring grain crops, maize, flax, potato and beet protection. In the "Catalogue of pesticides and fertilizers allowed for application in the Republic of Belarus", 33 herbicides with the content of the this group active ingredient are registered. In the total volume of herbicide application, the share of indicated preparations makes already 15-18%. Herbicides, sulfonylurea derivatives, are not effective enough against overgrown weed plants, especially Chenopodium album; for destroying it, the mixtures of 2,4-D and MCPA are used. Taking into account the fact that weed plants with the acquired resistance to herbicides in Belarus are not economically important, special research on their identification and biology are not carried out..